How to determine Windows 10 version when it is not running? I have upgraded my Windows 8 to Windows 10 recently. After that, I bought a SSD drive for my notebook and removed the regular HDD drive from it and installed a fresh copy of Windows 10 (Home edition). The HDD was put in a external USB case, so I can access my old files and old Windows installation partition as well. The problem is now I'm having some issues to activate my fresh installation of Windows. I'm not really sure that I should've installed Windows 10 Home or another version. How can I determine which Windows version is in the old HDD, given that all files are still accessible, but the system itself is not running? I could just swap the SSD and the HDD again and boot the old system, but it'll be better to find a "software" way of doing that. This answer addresses what I'm looking for, but for Windows XP. The proposed file doesn't exists in my old installation. Where is my Windows OS Product information stored? In a functional copy of windows, there is a couple of registry values which contain information about the Windows system. The registry 'hive', which is a subset of keys and values for the system, contains information such as CurrentVersion, ProductName and EditionID - these can be used to evaluate your type of Windows. To check your version of Windows, locate the CurrentVersion value. 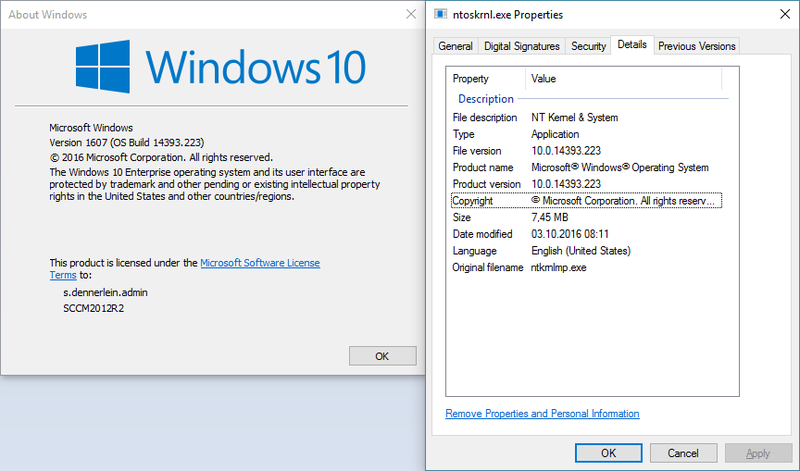 If you are running Windows 10, there are two new values that can be used to evaluate the OS version, CurrentMajorVersionNumber and CurrentMinorVersionNumber. What if I want to check the version of an offline Windows? Plug the offline storage of Windows into a host machine (E.g. An old copy of Windows on a HDD). Open the host system's Registry Editor by running regedit.exe. Select the HKEY_LOCAL_MACHINE folder. Click File/Load Hive. Load the SOFTWARE hive from you offline Windows folder. Do not import the hive. Give the loaded hive a recognizable name so that you can locate it later. View/Modify the loaded hive/value is required. Click File/Unload Hive once you are done. Alternatively, you can use a third-party registry editor on you host machine to view/modify the hives. You must then cross-reference that version number with known version numbers found on the Internet. How can I determine the installed edition of Windows XP if the OS does not boot up? How to activate Windows 10 Pro without installing previous version first? What happens to my Windows 10 license when I install fresh on a new SSD?